Kolor Autopano is a software dedicated to the creation of panoramas, virtual tours and gigapixel images. Based on Autopano Pro software and including all its featues, Autopano Giga goes far beyond the creation of panoramas : stitch your images in 360°, export them into Flash virtual tours, link the tours together… so many possibilities to present in a new way all the photos and places you want to share. Resolution matters? 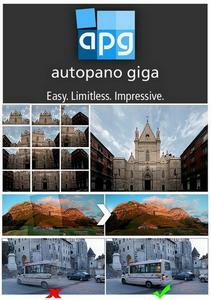 Autopano Giga also enables you to stitch in a record time several hundred or thousand images to create photos of several gigapixels.